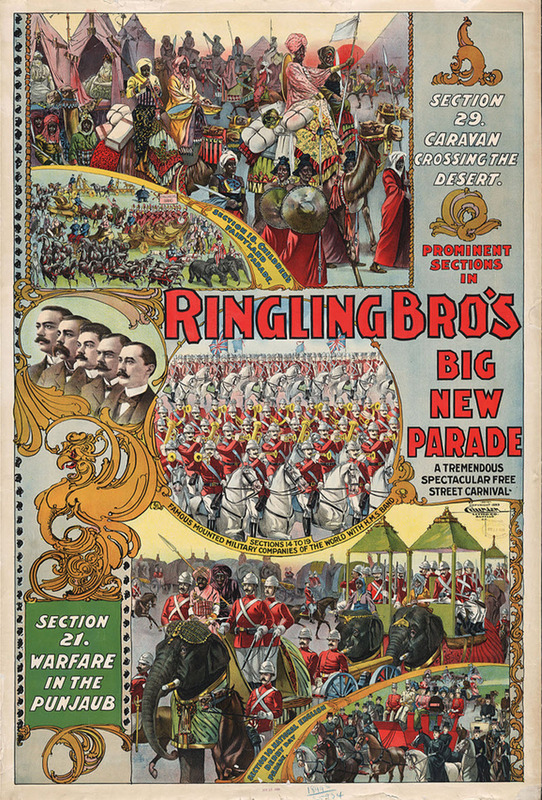 It’s 1899 and the Ringling Brothers Circus is in town. What better way to spend a Sunday afternoon in July? Come out and watch a tremendous spectacular free carnival featuring famous mounted military companies of the world with bands. Section 21 of the Parade will display Warfare in the Punjaub complete with war elephants! And section 29 of the parade will feature a Caravan Crossing the Desert! Which comes right after the Children’s Fairyland Parade complete with tiny horses and elephants. Sounds like it was an elaborate and extremely big circus parade. The emphasis on military pageantry for what was primarily a children’s entertainment is an interesting reflection on how our values have changed since then.